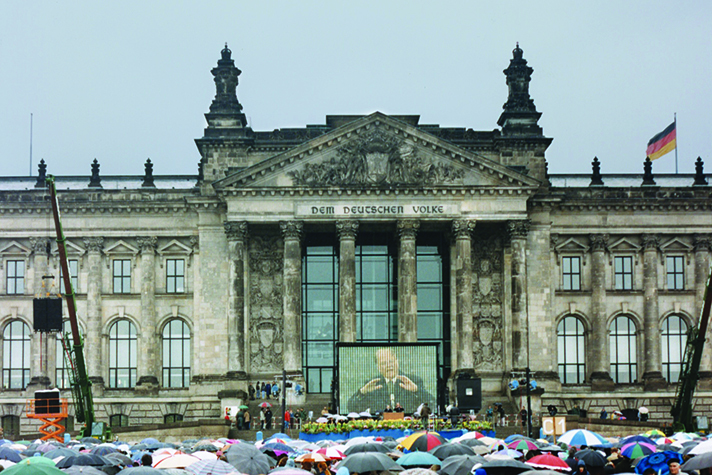 A few months after the fall of the Berlin Wall, Billy Graham preached in front of the Berlin Reichstag, next to the Brandenburg Gate and the remains of the Wall. In the first joint crusade for East and West Berliners, Reverend Graham shared the Gospel of Christ freely in a public square. It was at this event that Michael Furchert first heard Billy Graham and dedicated the remainder of his life in freedom to become an evangelist as well. Furchert now shares his nation’s dramatic history and his family’s inspiring story with audiences across America. As the crisis in Ukraine continues to capture the world’s attention, Christians everywhere are praying for the church in that nation, that the will of God would prevail and there will be a just and peaceful resolution. The revolution that ousted Ukraine’s autocratic leader bore similarities to the collapse of communism in Eastern Europe in 1989. One of those remarkable revolutions saw the fall of the Berlin Wall, one of the iconic symbols of communism, 25 years ago this month. In this story, East Berlin native Michael Furchert reflects on the fall of communism. Two years later, our East German dictator, Erich Honecker, responded with defiance: the Berlin Wall would stand for another 100 years, he declared in January 1989. He was sure that no democracy, no religion and no god could triumph over communism. Yet, the spirit of liberty that had echoed from the Brandenburg Gate to the reforms in the Soviet Union and into the hearts of many East Germans would prove him wrong. Growing up behind the Berlin Wall, I learned early to defend my faith in Jesus Christ in the midst of a secular society and socialist education system. My father had lost his job because of his Christian beliefs and had later become a pastor. Our Church was oppressed, open evangelism prohibited, and Christian publicans strictly censored. In public schools and work places, believers were pressured to leave the church and to follow communism. “Without God and without sun we will get the harvest done,” was a slogan taught to the farmers in our communities. And to children in school, this song: “We need no god, no king, no emperor to save us; to redeem us from our misery we must arise ourselves.” My sisters and I did not participate. We were among the 2 percent of East German students who refused to join the communist youth organizations or to conform to their beliefs. Thus I lost the privilege to obtain a driver’s license, participate in my graduation ceremony, or attend college. By the time I was 17, the Peaceful Revolution had begun. Between September and October 1989, the weekly prayer marches and demonstrations in Leipzig had grown from 8,000 to 300,000 people. Now the peaceful protests had reached Berlin. “We-Are-The-People! The-Wall-Must-Go” people chanted as police vehicles advanced. Armed officers jumped off their trucks and quickly linked arms to form an impenetrable chain. We did not have the freedom to demonstrate. My aunt had been arrested for lighting a candle in front of her apartment building as a sign of peace. My art teacher had been imprisoned for laying down a wreath of flowers commemorating the victims killed at the Berlin Wall. Any unauthorized gathering was quickly brought down by the STASI secret police. Now thousands of people filled the streets. My brother-in-law had been drafted into the military, which was put on high alert. The tanks were ready to move in. In June 1989 hundreds of students had been killed during demonstrations in Communist China. Our government praised the massacre at China’s Tiananmen Square and prepared for a similar solution. Growing numbers of students, workers, artists and oppositionists now joined the weekly Prayers for Peace. In the churches they found a safe haven to freely discuss their concerns. They found pastors to pray with them or help them seek dialogue with the communist regime. Here they heard the Gospel of Jesus Christ: “Love your enemies, do good to those who hate you, pray for those who mistreat you!” By early November, the prayer vigils of Leipzig and Berlin had grown into a nationwide movement. Out of the churches we marched into the streets, with burning candles in our hands, with songs of praise and freedom on our lips, approaching the soldiers who awaited orders to shoot. The police started to beat and arrest people. Secret agents infiltrated the crowds to incite violence. They wanted someone to throw a rock or overturn a car—anything to give the military a reason to open fire. Again and again, church leaders called upon people to resist aggression and to pray for peace. One lady kneeling on the street in prayer arose and put a flower into the muzzle of a gun. She watched a tear roll down the soldier’s cheek. Not one shot was fired. Instead, the Berlin Wall came down. Months earlier, the dictator had announced that the Wall would stand for another century. Now people were dancing on that Wall singing the famous German hymn Now Give All Thanks to God. On Nov. 9, 1989, our family stepped over the rubble of the Wall into freedom to be reunited with our relatives. Nazi Germany had ended in ruins. The communist regime had collapsed. Our faith had outlasted man-made empires and triumphed. The fallen dictator now turned to the Christian Church. Having lost his government mansion he needed a place to stay until his trial would start. Nobody wanted to take him in. The ministry of our colleague Pastor Uwe Holmer was known for never turning anyone away who came in need. Even though Holmer’s seven children had been denied a college education because of their faith, the pastor opened his heart and took in those who had persecuted his church and family. The Honeckers were their guests, lived in their house and ate at their table. They walked with the pastor through his garden as he shared the Gospel. When the Holmers prayed before every meal, the former dictator and his wife bowed their heads, as well. After the trial, Pastor Holmer visited the sick and frail Honecker in prison, witnessing to him God’s salvation and forgiveness. A few years later Honecker died. Still today many credit Christianity for the fall of communism in Eastern Europe. Even Communists were forced to recognize that faith and prayer have the power to impact lives, transform societies and change history. Michael Furchert is a Christian speaker and pianist based in Duluth, Minn.